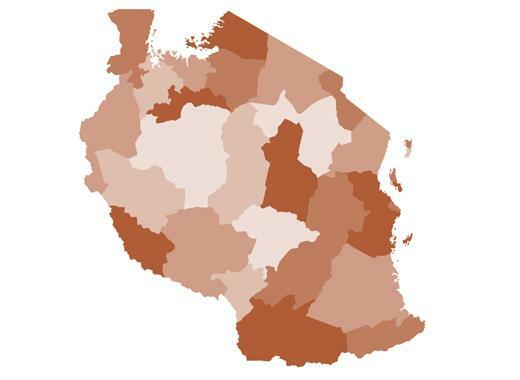 Tanzania is the largest country in East Africa. Because of its size, its growing regions are far apart and incredibly different. Kilimanjaro, to the north, produces coffees with chocolate and caramel flavors, while coffees from the Mbeya region, in the southwest, are known for their distinctive citric acidity. Tanzania’s annual production is climbing toward 800,000 bags a year. There are approximately 450,000 coffee producers, most of whom have farms between 0.9 and 3 hectares in size. In Tanzania, Volcafe Way has a dedicated team of six field officers and 10 farmer trainers who are knowledgeable in good agricultural practices and certification programs. They regularly visit households, helping coffee families to optimize their incomes and coffee production. Over two years, a Stop Child Labor project helped farmer support workers to help households find needed income and send 437 children back to school. Once known for commercial “Amex” coffees, this region now produces some of the country’s finest mild Arabica coffees, known for their medium-bold intensity, a sweet, berry note and a hint of chocolate. Also known as the Northern zone, Kilimanjaro is mix of smallholders and large estates. It’s known for producing a cup with a soft, pleasant acidity, full body and warm, rich flavors. Now considered the top mild Arabica-growing region in Tanzania, Mbeya produces an estimated 12,000 to 15,000 tons annually. Its coffees feature a light to medium acidity, medium body and bright, citrusy flavors.